Most people use their lofts purely for storage, and the chances are you’re probably not even sure what exactly you’ve got up there! Many of us tend to use the attic as storage for items that we will rarely if ever use, treasured possessions and valuable items that don’t have any other place in the home. But why waste the sizeable space of your attic on clutter and junk when you could utilise that space for another bedroom, bathroom, office, games room – the list goes on. So grab your tape measure and see how much space you’ve got to take advantage of. The ceiling should be no lower than 2.3m to provide enough headroom – and the steeper the slope (or pitch) of your roof, the more suitable it will be for an attic conversion. 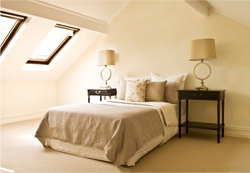 To create even more light and space in your new room, consider a dormer loft conversion. Dormer windows extend out from the roof and can range from one window to spanning the length of your home. Be aware of how it will look from the outside though, and make sure it’s not too big or out of place. Our experienced installers will help and advise you on choosing a suitable dormer loft conversion for your requirements. 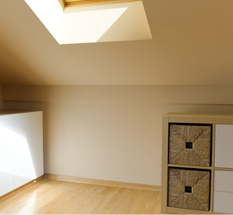 Part loft conversions involve completing all the structural work such as installing a dormer or windows. You are then free to complete the interior project yourself, so part loft conversions are better suited to DIY enthusiasts and those that have a very specific goal in mind. Now you’ve got an idea of what type of loft conversion would suit you and what you want to do with your newly gained space, you’re no doubt eager to get started. But before you do, there are a few things to think about to make the whole process smoother and simpler in the long run. If you want to turn your loft into a bathroom, make sure your system can cope with the extra pressure needed to supply hot and cold water to an extra floor. Think about how the available space will affect the proportions of your new room. Will there be space for a double bed if you’re planning a bedroom, and is there enough height on either side of the bed to make getting in and out comfortable? Plan where your electrical points will go and think about sound-proofing to minimise room to room noise. Is there enough insulation and ventilation to keep the room comfortable? Is there enough light? Can your boiler cope with extra radiators? Bearing these points in mind before beginning your loft conversion will help save you time and money later on. It’ll also give you a greater understanding of the overall look of the room when you’ve finished, so you can start concentrating on other details too. At Interloft we provide a complete loft conversion service in Yorkshire and the surrounding areas including Leeds, Harrogate and Wakefield. With years of experience in the industry and a past portfolio of a wide range of attic conversions including part loft and dormer, we are ideally placed to advise you on all aspects of your project. We complete all loft conversion projects in 6-8 weeks and work closely with you to ensure your individual requirements are met, whatever you plan on using your new space for. From planning and design to completing the final phases of the installation, our dedicated experts are on hand to help – and we never use sub-contractors so you can be assured of an outstanding service every time. So if you’re planning a loft, dormer or part loft conversion in Yorkshire, choose Interloft for a reliable, friendly and professional service every time. Call us now on 0800 999 4034 for a FREE no obligation quote!